A plush Beanbag. Please Read :Payment:I accept Paypal only and payments are due within 3 days after winning the bid. 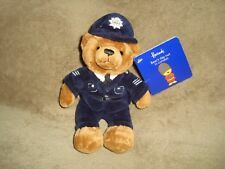 Harrods Bear's Day Out In London Policeman Plush & Beans With Tags 8"
Harrods Bear's Day Out In London Beefeater Plush & Beans With Tags 7"
Top Rated SellerBrand: HarrodsSize: 7in. He has a olive green satin ribbon with Harrods written in gold colored lettering tied around his neck. Harrods is stitches on the bottom of his left foot. Teddy Bear. A plush Beanbag. Harrods Easter Bunny From England 9 Inches Contact me with any questions. From United StatesBrand: HarrodsSize: 9in. Harrods Harrod's London England Plaid Tartan Queen Guard Plush Teddy Bear 8.5"
He is soft, fuzzy, clean, and cuddly! He is gently used. Harrods Knightsbridge London Collectible Plush Teddy Bear. 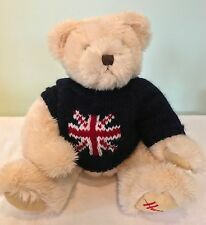 This adorable teddy bear is sporting a navy blue Union Jack applique hooded top and has "Harrods" embroidered in navy blue on its paw. As pictured. 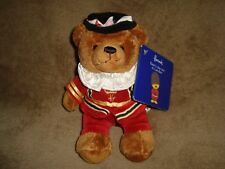 Harrods Knightsbridge Queens Palace Guard Plush Teddy Bear. Paddington Bear 15' Harrod's London 2012 Wonderful outfit Excellent CONDITION. PLEASE SEE PHOTOS FOR CONDITION. Sold as is. No returns. Payment due at time of purchase. Item will be shipped as immediately as possible after payment is posted . Excellent condition. Like new. Fast shipping. The bear with the green vest has jointed legs. These bears were never played with and were only displayed on a shelf. Neither of them have jointed arms. Vintage Harrods Easter Bunny From England 10 Inches Contact me with any questions. Sits 9" tall. New Royal plush collection bear. Adorned with gold-tone wings to fly away on magical adventures, the super-soft friend is accented with movable arms waiting to be cuddled. Make Sparkle the Dragon your new best friend. Soft-to-the-touch, this delightful character will provide endless love and hugs. He wears a Removable Red Fleece Toggle Coat (similar to Paddington Bear) with a Hood, Navy Blue Cuffs and Interior Hood Lining, and Harrods "H" sold signature logo-embroidered front pocket. RARE Light Brown Fluffy Silky Soft Teddy Bear 11" Tall Plush Toy Collectible wearing a Red Fleece Toggle Coat is No Longer Sold. HARROD'S 20th Anniversary X MAS. 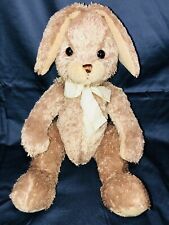 Teddy Bear "NICOLAS" Plush 2005. Harrods Light Golden Brown Teddy Bear Green. Bow Stuffed Plush Animal Soft Toy. New w tags, super cute with no flaws Please take a good look at all the pictures so you can see exactly what you are getting. Any flaws will be noted in the pictures. Please email me with any questions. I will combine shipping with my other listings whenever possible so please take a look at my brand new store Frozen Armadillo Depot! Thanks for looking and happy shopping! Harrods red vinyl tote bag. Lined in Harrods stamped fabric. Featuring adorable Teddy Bears playing cricket/croquet/tennis print. Small inside zip pouch on one side. Harrods Knightsbridge - My First Harrods Teddy. Green button on chest that says " My First Harrods Teddy". "My First Harrods Teddy" is embroidered into bottom of left foot. 7" plush Harrods teddy bear in guardsman uniform; purchased in London. Condition is New. Shipped with USPS First Class Package. Brown bear with red plush outfit and black hat. Harrods embroidered on one paw. From United StatesBrand: HarrodsSize: 15in. New Harrods Knightsbridge London. 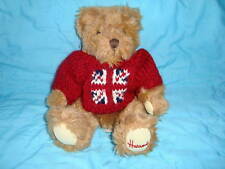 Plush / Stuffed Teddy Bear w/ British Union Jack Flag on Red Sweater. Matthew 5:10 ~ "Blessed are those who are persecuted for righteousness' sake, for theirs is the kingdom of Heaven.". Vintage Harrods 2000 Dated Bear 13 Inches Contact me with any questions. His head and legs move to sit or stand him up. Harrods Toy Kingdom. He has Harrods embroidered on his left foot. This beautiful lying beige bear. VERY RARE & HARD TO FIND ! Made in 2000. Gold Thread Embroidered Foot Pads Harrods 1849 and Harrods 1999. Gorgeous Golden Plush Collector'sHarrod's 150th Anniversary Special IssueTeddy Bear. Fully 5 way jointed. Harrods Dated Christmas Bear 2003 13 Inches Contact me with any questions. From United StatesBrand: HarrodsSize: 13in. Beefeater: 8 1/2" tall; 5 1/2" wide. Queen's Guard: 9 1/4" tall; 5 1/2" wide. This teddy bear is in wonderful condition. Harrods of Knightsbridge, London, England. 1989 White Christmas Polar Bear. I am downsizing so have to reluctantly let my bears go. 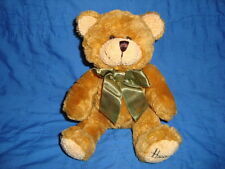 Up for your consideration is a 13" 2012 Harrod's Chester" teddy bear with hang tag attached. Hang tag shows wear/creasing. Black marker writing on tush tag. Puppets include a 4" Royal Guardsman, a 3" Beefeater, and a 3" Bobby/Policeman along with the Bus that is 6" long, 6" high and 5" wide. The bus has a carry handle for easy handling. This is a very rare item, as I understand that only a few were made available to the public. The Harrods motto is Omnia Omnibus Ubique - All things for all people, everywhere. This lovely teddy bear will be gently and carefully wrapped for its loving new owner. 2 ) site and has over one million square feet (90,000 m.
I am not an expert on grading, nor do I claim to be. He is a sweet bear with a striped winter scarf. He is also holding a felted gingerbread man. Every year Steiff and Harrods do a collaboration creating the Steiff version of the annual Harrods bear. Harrods Christmas Bear. Very sweet collectible bear by Harrods. for more Harrods Collectibles. Be careful of imitations and smaller versions of these Jumbo bears. Foot Dated. Christmas Bear. This is NOT a small bear.